The downtown area will turn into a party zone next week for Mardi Gras revelers. Downtown Honolulu transforms itself into a local version of New Orleans' French Quarter next week, with Mardi Gras celebrations planned at Aloha Tower Marketplace and along Nuuanu Avenue. 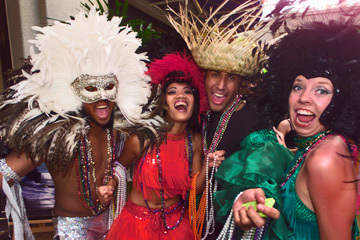 Generally recognized as Fat Tuesday, the last day before the start of Lent provides one last opportunity for believers (and everyone else, for that matter) to party. While the actual date varies from year to year, Fat Tuesday is always followed by Ash Wednesday and, later, Easter. Aloha Tower Marketplace kicks things off at pau hana, with live entertainment on multiple stages from 5 to 9 p.m. Slim Junior and Slim Mango will perform at the Center Atrium, while Robert Cazimero plays at Chai's Island Bistro and Bluzilla takes over the space formerly known as Kapono's. New Orleans Zydeco Jazz and Zanuck Lindsey will be on stage at Gordon Biersch, and Hooters will entertain with a chicken-wing eating contest. A Brazilian-themed Mardi Gras Parade will make its way throughout the marketplace at 7 p.m.
AT ABOUT the same time, the sixth annual Nuuanu Mardi Gras Celebration gets started on Nuuanu Avenue between Pauahi and King streets. Both events feature free admission, although the Nuuanu block party also aims to raise funds for the Honolulu Culture and Arts District. The organization plays a large part in the revitalization of Chinatown and will receive a portion of the proceeds from food booths set up in the street. More than a half-dozen local restaurants have signed on to help. Entertainment will definitely have a Cajun flavor, with New Bayou and Bayou Cadillacs scheduled to perform along with Downtown Charlie and the Humbones and African drumming group Jammarek. A costume contest will take place at 9 p.m. Tuesday, and there will be jugglers, clowns and other street performers on hand to entertain. ON THE club front, it appears that the Wave Waikiki is the only spot actively promoting a Mardi Gras theme on Tuesday. With help from promoter Silvana, the Wave presents "Carnaval," complete with Brazilian dancers and a "Miss Mardi Gras" contest. DJs KSM and Byron the Fur will be in the mix at this 18-and-over party. Call 306-1940.